Guess Who? is a Hasbro board game made for simpletons and young children. 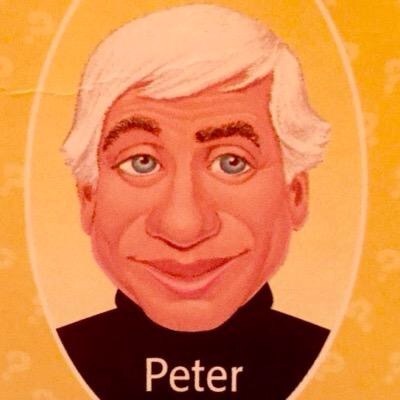 One night, while watching a group of people play a much more complicated game involving math and patterns, I remembered how fond I was of Guess Who. Does your person have a mustache? Is your person wearing a hat? What fun! Apparently, I wouldn’t stop talking about how desperately I wanted to play the game, because a week later David came home with a shrink-wrapped box he’d ordered on Amazon. That Friday, we played. Boy, was I excited! After about an hour of setting the game up (I don’t remember this part as a child…thanks everybody’s mom! ), we were ready to play. BECAUSE EVERYONE IN GUESS WHO IS WHITE! There are two people who might be hispanic, but I’m pretty sure they’re not. One guy may have traveled to the middle east for business, but he’s definitely white. I did not discover that everyone in Guess Who is white because I was trying to start a political revolution (which is obviously what I’m doing right now). I discovered this because I was trying to determine the most efficient way to win the game. My first thought was to start from a gendered place, but even that wasn’t effective. There are only five women! I couldn’t handle it. So, Guess Who includes no people of color and only five women ou of 24 characters. I was almost too upset to play, but not really. We played twice, because that’s all you can play Guess Who as an adult without feeling like something is wrong. The following Sunday, Heather came over for brunch. Obviously, we played Guess Who. I mentioned the moral bind I was in, the fact that I love playing Guess Who exactly twice, but hate the lack of diversity. Heather told me that there used to be black people in the game. We did our Googles, and there was once a black woman named Anne. 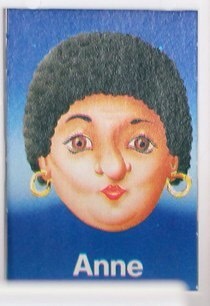 Anne was very light-skinned, with a nice afro and hoop earrings. Facially, she’s ethnically ambiguous, so I’m guessing that’s what the afro and hoop earrings were there for. All of the characters are wearing turtlenecks, so they couldn’t dress her in a dashiki or anything. -Has your person been to more than three Reba McEntire concerts? -Is your person serving as a dug mule right now? -Has your ever framed someone else for a crime that he or she committed in cold blood? -Has your person ever gone into a hair salon with a photo of Reba McEntire for reference? -Does your person have “grandkids” that are exotic birds? I think these questions would make for a much quicker game. I hope that by the time I have kids who are Guess Who-playing age, the question, “is your person black?” is relevant (what a small, simple request for the distant future!). If not, I will have to create my own game called Who Dat? Who Dat will will feature a diverse array of faces that are not creepy at all. And no turtle necks. Just good, clean minority fun in crew necks! And it’ll come fully assembled, so you won’t spend more time putting it together than playing. But we all know I don’t really feel like creating a board game (I’d rather Yelp restaurants I’ll never go to), so get it together, Has-bruh. Start small. Make Anne black again.